A simple and easy to use plugin to create fullscreen scrolling websites (also known as single page websites or onepage sites). It allows the creation of fullscreen scrolling websites, as well as adding some landscape sliders inside the sections of the site. Customizations of the plugin available upon request for some reasonable price. <a href="http://alvarotrigo.com/#contact-page">Contact me</a>. 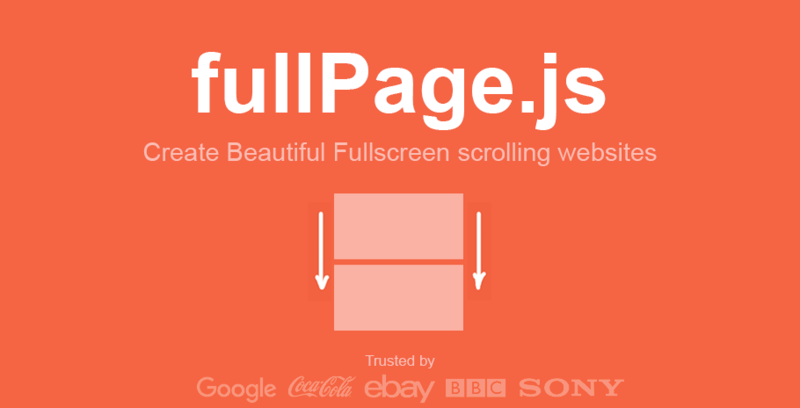 Would you like to have a website using fullpage.js functionality but you don't know how to use it? I can do it for you for a reasonable price. <a href="http://alvarotrigo.com/#contact-page">Contact me</a>. Suggestion are more than welcome, not only for feature requests but also for coding style improvements. Let's make this a great plugin to make people's lives easier! fullPage.js is fully functional on all modern browsers, as well as some old ones such as Internet Explorer 8, 9, Opera 12, etc. It works with browsers with CSS3 support and with the ones which don't have it, making it ideal for old browsers compatibility. It also provides touch support for mobile phones, tablets and touch screen computers. Optionally, you can add the jQuery UI library in case you want to use other easing effects apart from the ones included in the jQuery library (linear, swing and easeInOutCubic) or the one included by default in fullPage.js (easeInQuart). ###Required HTML structure Each section will be defined with an element containing the section class. The active section by default will be the first section, which is taken as the home page. If you want to define a different starting point rather than the first section or the first slide of a section, just add the class active to the section and slide you want to load first. You can see a fully working example of the HTML structure in the demoPage.html file. If you are using fullPage.js with anchor links for the sections (using the anchors option), then you will be able to use anchor links also to navigate directly to a certain slide inside a section. This would be an example of a link with an anchor: http://alvarotrigo.com/fullPage/#secondPage/2 (which is the URL you will see once you access to that section/slide manually) Notice the last part of the URL ends in #secondPage/2. In this last case, the URL we would use would be #secondPage/slide3, which is the equivalent to our previous #secondPage/2. controlArrows: (default true) Determines whether to use control arrows for the slides to move right or left. verticalCentered: (default true) Vertically centering of the content within sections. When set to true, your content will be wrapped by the plugin. Consider using delegation or load your other scripts in the afterRender callback. resize: (default false) Whether you want to resize the text when the window is resized. scrollingSpeed: (default 700) Speed in milliseconds for the scrolling transitions. anchors: (default ) Defines the anchor links (#example) to be shown on the URL for each section. The position of the anchors in the array will define to which sections the anchor is applied. (second position for second section and so on). Using anchors forward and backward navigation will also be possible through the browser. This option also allows users to bookmark a specific section or slide. Be careful! if you use anchors, they can not have the same value as any ID element on the site (or NAME element for IE). lockAnchors: (default false). Determines whether anchors in the URL will have any effect at all in the plugin. You can still using anchors internally for your own functions and callbacks, but they won't have any effect in the scrolling of the site. Useful if you want to combine fullPage.js with other plugins using anchor in the URL. Important It is helpful to understand that the values in the anchors option array correlate directly to the element with the class of .section by it's position in the markup. easing: (default easeInOutCubic) Defines the transition effect to use for the vertical and horizontal scrolling. It requires the file vendors/jquery.easings.min.js or jQuery UI for using some of its transitions. Other libraries could be used instead. easingcss3: (default ease) Defines the transition effect to use in case of using css3:true. You can use the pre-defined ones (such as linear, ease-out...) or create your own ones using the cubic-bezier function. You might want to use Matthew Lein CSS Easing Animation Tool for it. loopTop: (default false) Defines whether scrolling up in the first section should scroll to the last one or not. loopBottom: (default false) Defines whether scrolling down in the last section should scroll to the first one or not. loopHorizontal: (default true) Defines whether horizontal sliders will loop after reaching the last or previous slide or not. autoScrolling: (default true) Defines whether to use the "automatic" scrolling or the "normal" one. It also has affects the way the sections fit in the browser/device window in tablets and mobile phones. scrollBar: (default false). Determines whether to use scrollbar for the site or not. In case of using scroll bar, the autoScrolling functionality will still working as expected. The user will also be free to scroll the site with the scroll bar and fullPage.js will fit the section in the screen when scrolling finishes. paddingTop: (default 0) Defines the top padding for each section with a numerical value and its measure (paddingTop: '10px', paddingTop: '10em'...) Useful in case of using a fixed header. paddingBottom: (default 0) Defines the bottom padding for each section with a numerical value and its measure (paddingBottom: '10px', paddingBottom: '10em'...). Useful in case of using a fixed footer. continuousVertical: (default false) Defines whether scrolling down in the last section should scroll down to the first one or not, and if scrolling up in the first section should scroll up to the last one or not. Not compatible with loopTop or loopBottom. animateAnchor: (default true) Defines whether the load of the site when given an anchor (#) will scroll with animation to its destination or will directly load on the given section. recordHistory: (default true) Defines whether to push the state of the site to the browser's history. When set to true each section/slide of the site will act as a new page and the back and forward buttons of the browser will scroll the sections/slides to reach the previous or next state of the site. When set to false, the URL will keep changing but will have no effect ont he browser's history. This option is automatically turned off when using autoScrolling:false. Note: the menu element should be placed outside the fullpage wrapper in order to avoid problem when using css3:true. Otherwise it will be appended to the body by the plugin itself. navigation: (default false) If set to true, it will show a navigation bar made up of small circles. navigationPosition: (default none) It can be set to left or right and defines which position the navigation bar will be shown (if using one). navigationTooltips: (default ) Defines the tooltips to show for the navigation circles in case they are being used. Example: navigationTooltips: ['firstSlide', 'secondSlide']. showActiveTooltip: (default false) Shows a persistent tooltip for the actively viewed section in the vertical navigation. slidesNavigation: (default false) If set to true it will show a navigation bar made up of small circles for each landscape slider on the site. slidesNavPosition: (default bottom) Defines the position for the landscape navigation bar for sliders. Admits top and bottom as values. You may want to modify the CSS styles to determine the distance from the top or bottom as well as any other style such as color. sectionSelector: (default .section) Defines the jQuery selector used for the plugin sections. It might need to be changed sometimes to avoid problem with other plugins using the same selectors as fullpage.js..
slideSelector: (default .slide) Defines the jQuery selector used for the plugin slides. It might need to be changed sometimes to avoid problem with other plugins using the same selectors as fullpage.js. responsiveWidth: (default 0) A normal scroll (autoScrolling:false) will be used under the defined width in pixels. A class fp-responsive is added to the plugin's container in case the user wants to use it for his own responsive CSS. For example, if set to 900, whenever the browser's width is less than 900 the plugin will scroll like a normal site. responsiveHeight: (default 0) A normal scroll (autoScrolling:false) will be used under the defined height in pixels. A class fp-responsive is added to the plugin's container in case the user wants to use it for his own responsive CSS. For example, if set to 900, whenever the browser's height is less than 900 the plugin will scroll like a normal site. Scrolls the page to the given section and slide. The first slide, the visible one by default, will have index 0. Exactly the same as moveTo but in this case it performs the scroll without animation. A direct jump to the destination. Sets the scrolling configuration in real time. Defines the way the page scrolling behaves. If it is set to true, it will use the "automatic" scrolling, otherwise, it will use the "manual" or "normal" scrolling of the site. Be careful when combining this option with scrollOverflow set to true, as it might be difficult to scroll using the mouse wheel or the trackpad when the section is scrollable. Sets the value for the option fitToSection determining whether to fit the section in the screen or not. Sets the value for the option lockAnchors determining whether anchors will have any effect in the URL or not. Adds or remove the possibility of scrolling through sections by using the mouse wheel/trackpad or touch gestures (which is active by default). Note this won't disable the keyboard scrolling. You would need to use setKeyboardScrolling for it. directions: (optional parameter) Admitted values: all, up, down, left, right or a combination of them separated by commas like down, right. It defines the direction for which the scrolling will be enabled or disabled. Adds or remove the possibility of scrolling through sections by using the keyboard arrow keys (which is active by default). Defines whether to record the history for each hash change in the URL. Defines the scrolling speed in milliseconds. type: can be empty or all. If all is passed, the HTML markup and styles used by fullpage.js will be removed. This way the original HTML markup, the one used before any plugin modification is made, will be maintained. //destroy any plugin event and any plugin modification done over your original HTML markup. Updates the DOM structure to fit the new window size or its contents. Ideal to use in combination with AJAX calls or external changes in the DOM structure of the site. You can see them in action here. anchorLink: anchorLink corresponding to the section. index: index of the section. Starting from 1. In case of not having anchorLinks defined in the plugin the index parameter would be the only one to use. ###onLeave (index, nextIndex, direction) This callback is fired once the user leaves a section, in the transition to the new section. Returning false will cancel the move before it takes place. index: index of the leaving section. Starting from 1.
nextIndex: index of the destination section. Starting from 1.
direction: it will take the values up or down depending on the scrolling direction. ###afterRender() This callback is fired just after the structure of the page is generated. This is the callback you want to use to initialize other plugins or fire any code which requires the document to be ready (as this plugin modifies the DOM to create the resulting structure). ###afterResize() This callback is fired after resizing the browser's window. Just after the sections are resized. ###onSlideLeave (anchorLink, index, slideIndex, direction, nextSlideIndex) This callback is fired once the user leaves an slide to go to another, in the transition to the new slide. Returning false will cancel the move before it takes place. slideIndex: index of the slide. Starting from 0.
direction: takes the values right or left depending on the scrolling direction. nextSlideIndex: index of the destination slide. Starting from 0. ####Cancelling a move before it takes place You can cancel a move by returning false on the onSlideLeave callback. Same as with onLeave. If you want your page to be listed here. Please <a href="mailto:alvaro@alvarotrigo.com">contact me</a> with the URL. You can find another list here.